Touch a taxidermied lion in the name of art. There are lots of reasons people venture into taxidermy. They might want to boast of their hunting conquests (not okay), they could eerily try to preserve a dead pet (not quite okay), or maybe they just work at the Natural History Museum (okay). Rod McRae's latest showing at Deakin University Art Gallery takes a little from each of these worlds, while staying true to none of them. Stating his main themes as conservation, hunting culture, biodiversity, stewardship, colonisation and climate change, McRae's exhibition is inherently political. 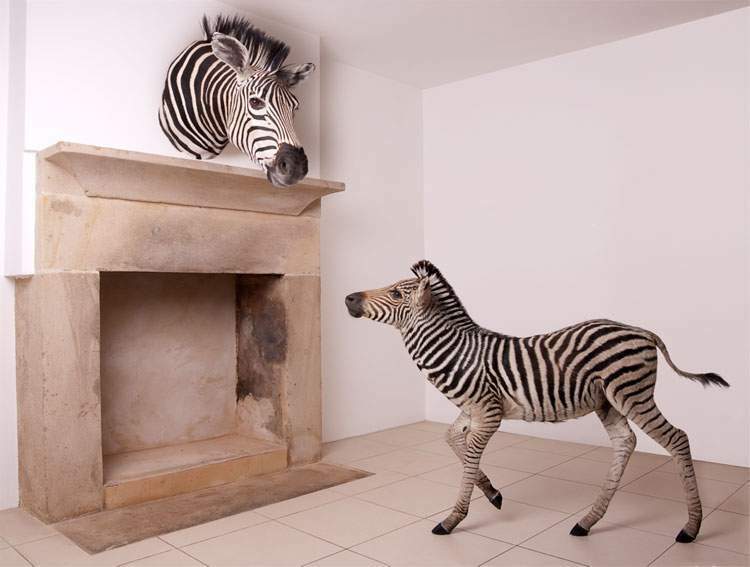 Featuring myriad taxidermied animals in strange and surreal environments, Wunderkammer is essentially about questioning our relationship with such animals and how audiences react when confronted with once wild creatures in close quarters. Disclaimer from the gallery: All the animals in Wunderkammer have been ethically sourced. No animal has been harmed to make this work in the first instance; the skins are the result of death by natural causes, medical euthanasia, hunting, culling and/or food production and have been traded on, sometimes multiple times, before they became part of this body of work.